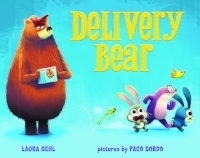 Laura Gehl is the author of the new children's picture book Delivery Bear. 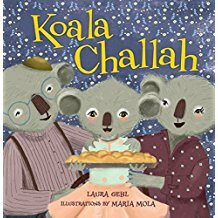 Her other books for kids include the Peep and Egg series and Koala Challah. She is based in the Washington, D.C., area. Q: How did you come up with the idea for Delivery Bear? A: Delivery Bear was a mash-up of two completely different story ideas. First of all, I wanted to write a book about a cookie delivery service (possibly inspired by my mom signing me up for the Dessert of the Month club when I was at summer camp almost 30 years ago!). Separately, I wanted to write a book about a friendly bear whose appearance scared other animals. Those two ideas turned out to go together like cookies and milk, and Delivery Bear was born. Q: What do you think Paco Sordo's illustrations add to the book? A: The main character in Delivery Bear is Zogby, a bear whose dream job is to deliver cookies for the Fluffy Tail Cookie Company. Paco made Zogby’s sweet, lovable personality absolutely shine through on every page. The problem standing between Zogby and his dream job is that the Fluffy Tail Cookie Company is staffed entirely by bunnies. When a customer hears the cookie delivery song and opens the door, that customer expects to see a small, cute bunny holding a box of cookies. So when Zogby sings the cookie delivery song and a customer opens the door, the customer is shocked to see a huge bear! Paco did a great job of showing the shock on each customer’s face. A: I hope that kids see Zogby following his dreams, persevering, finding a new approach to the problem, and eventually succeeding—and know they can do the same. I hope kids think about not judging others by their appearances. And I hope kids notice that Zogby succeeds in the end by standing out and being himself…not by trying to fit in with bunny ears and whiskers. A: I am finishing up revisions on a book I am very excited about—my first picture book biography. The book is called Always Looking Up: a Story of Astronomer Nancy Grace Roman and will be out from Albert Whitman in the fall of 2019. I’m also working on the fourth book in my Baby Scientist board book series, Baby Paleontologist. The first two books in the series—Baby Oceanographer and Baby Astronaut—will be out from Harper Collins next spring. A: You can see the book trailer for Delivery Bear here. In addition, you can hear Zogby singing the original Fluffy Tail Cookies delivery song, as well as his own unique version, on my website. You may notice Zogby is signing the songs to the tune of the ABC’s. Adults reading Delivery Bear out loud may also find it easiest to sing the songs to that tune. There are classroom activities to accompany Delivery Bear on my website too. 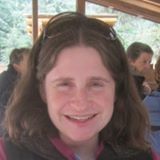 --Interview with Deborah Kalb. 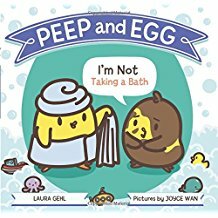 Here's a previous Q&A with Laura Gehl.